Script is a tool that allows you to automate tasks and add custom functionality to your printer. For instance you may define your own page layout, delete or select pages based on your own criteria. Script could be executed manually by clicking on a special button in Quick Access Bar or started automatically, for each new print job. Control priPrinter window, ribbon and buttons. Load additional jobs. Close jobs. Get access to source pages: remove, copy, insert, change position, crop, select, etc. Modify layout or create a new one. Print, save to images or pdf. Add Custom button to ribbon (extensions). Extension is an extended version of script. In additional to text of script itself it has images for buttons, information about commands and so on. Learn more. If you have a script file, just put into priPrinter scripts folder and it will be available from scripts menu. If you don't know where this folder is, select View tab, click on Extensions button and choose "Extension Manager...". Click Organize button and select View Files... Windows Explorer will be opened, just drop script file there. Script and Extension can be installed with Extension Manager. It is possible to launch script by clicking on button in Quick Access bar. In order to create such button click on Customize button and select "Create New Script Command". You will need to select name script file and icon. 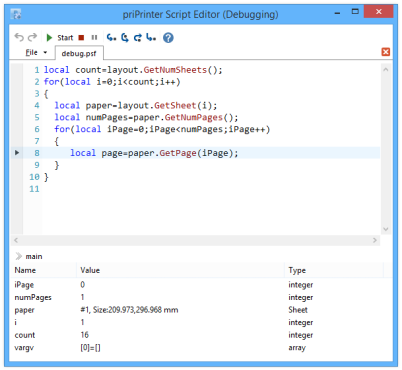 priPrinter 6.1 has build in script editor with syntax highlighting and debugger. priPrinter uses "Squirrel" programming language as base of scripting engine. It's small, fast and feature rich scripting engine, it perfectly fits into existing priPrinter environment. 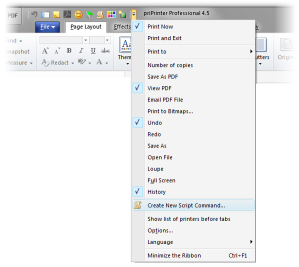 priPrinter Scripting is part of priPrinter Professional edition.